This is the new doggie. I don’t have a name for her yet, so any suggestions are welcome. 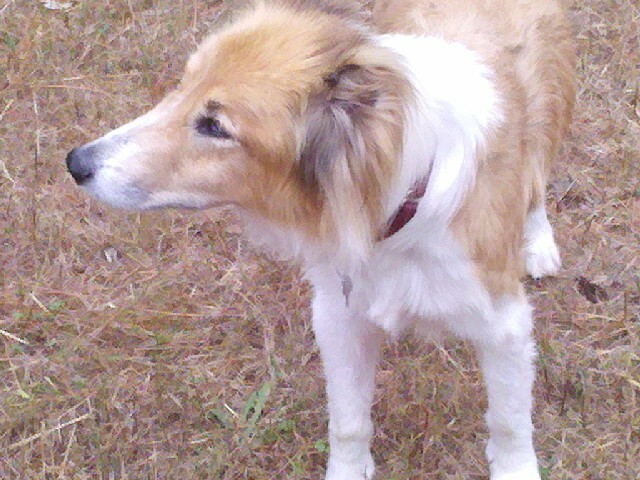 Thanks to the Collie Rescue of the Carolinas for bringing her to me. She’s a sweet pup. I’m not sure how old she is, but the vet paperwork says “> 8.” She seems to be deaf, so it’s ok that I don’t have a name for her yet. She does respond to hand gestures, which is pretty cool. I can motion to her to come to me, and she does! Here’s a picture I took yesterday. I think she’s feeling safe and secure here. 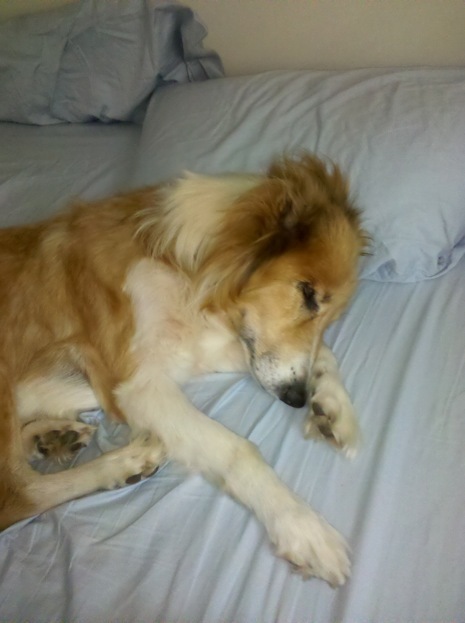 She took over my bed! I’m still considering names, but her inability to hear me call her means there’s no rush. She’s quite a pistol. She’s getting into the garbage and eating cat food. We walk every night, when it cools down a bit, and we’re both enjoying that. Once the temperature gets a little cooler, we’ll start going to the park to walk. Buddy used to love that, and I hope the new doggie loves going there, too. Previous: I miss you, Buddy! Her coat seems to have really come on since the first pic on the rescue website – bit like mine! ;D She’s adorable! Yes, what a pretty coat. I agree with Paula…she looks great now! Thanks to all your TLC, for sure. Congratulations on the new addition to your family. I know you will become the best of friends. I was sorry to read about your dear Buddy. Your new addition is gorgeous. September certainly seems to have been a doggie month. Helen was the first thing I thought of too when I read she is deaf. I vote for WHEEZY. ;o) I wanted to name our pup that. I say it like George Jefferson but nobody went for it. Funny thing is, our pup does breath funny when you hold her curled up and the name would have fit. Good luck with her. What a great thing to rescue a special needs doggie.She’s a lucky girl. I have to confess that I didn’t understand the reference to Helen Keller until you commented, Denise. What a dope I am! I wanted to mention, too, that she was mutilated at some point. Her ears and the end of her tail were cut off. She has a burn scar the length of her back, too.